Afternoon tea: A light meal, typically consumed between 3pm and 5pm. Traditionally consisting of loose tea, brewed in a teapot and served in teacups with milk and sugar, accompanied by sandwiches, scones with clotted cream and jam and a selection of cakes and pastries served on a tiered stand. The custom of drinking tea originated in England when Catherine of Braganca married Charles II in 1661 and bought the practice of drinking tea in the afternoon with her from Portugal. Although a rather old custom, afternoon tea has become somewhat more fashionable in recent years, with most of the big hotels serving their own takes on afternoon tea. 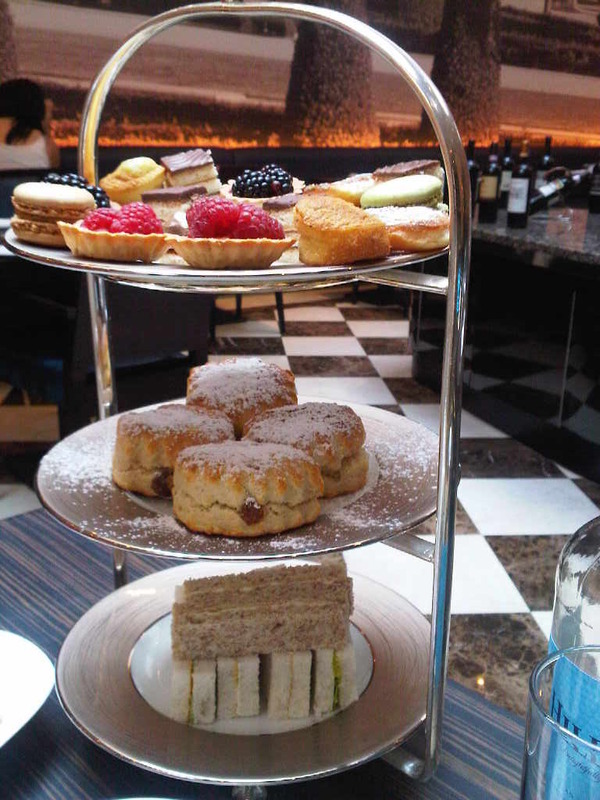 Thus for my mothers recent birthday I decided it would be a nice outing to head out to the Montcalm Hotel for a spot of afternoon tea (darrrlinggg). We arrived at the hotel just in time and were seated rather promptly in the restaurant. We were given a tea menu offering everything from traditional earl grey to more contemporary options such as Rose tea. Once we’d decided on our tea’s, I chose the rose tea whilst my mother picked the Darjeeling, we were bought our goodies. As described by my friends at Wikipedia, we were bought a selection of sandwiches which were slightly sparse with regard to filling, a selection of pastries and mini desserts which were quite yummy and 4 perfectly warm scones served with yes, you guessed it..clotted cream and jam. The teas were also up to scratch, whilst my mother was simply excited that the Darjeeling tea was actually hot, compared to the tea served during her afternoon tea session at Harrods only weeks before, my rose tea did exactly as it said on the tin and tasted exactly like roses. All in all, it was a nice little outing, although the sheer amount of sugar made its way into my blood stream a little to quick and resulted in a sugar induced headache!